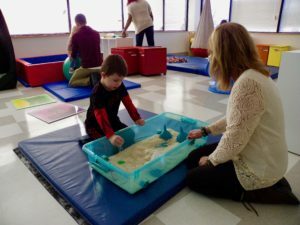 KLC Occupational Therapists (OTs) use a variety of therapeutic methods that include modifying the school or work environments and providing individualized adaptations to enhance performance and participation in school-based activities. As with all related services at KLC, the OT provides a fluid combination of individual, small group, integrative and consultative services to support academic achievement and life skill mastery. The OT’s role initially surrounds each child’s need to play and interact with their peers. At this level of programming the OT will assess a child’s development and provide strategies and interventions to facilitate the developmental continuum working on maintaining focus and attention. Each child’s individual sensory needs are assessed and a specific Sensory Plan is established for the purpose of stimulating or exciting the child as well as to calm and/or engage them in order to promote positive behaviors and enhance performance with learning opportunities. 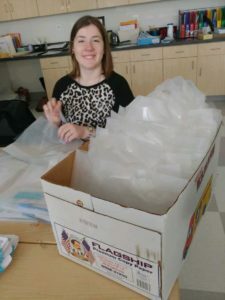 As a child continues through their school years the OT also supports students who have difficulty performing in areas such as self-care, leisure activities and work productivity with the emphasis on improving fine motor and sensory processing skills while working on academic, pre-vocational and self-care activities.